Cloud-storage startup Dropbox just closed a $250 million funding round, and now it has its eyes set on being the foundation of a future where we’re never without our data. Phone, tablet, TV, car, you name it. Dropbox plans to be integrated into everything, with its icon becoming to file access what Facebook’s icon has become to sharing. Mobile is the first and obvious area to begin — Forbes highlighted a partnership with HTC and six other pending mobile deals in an article this morning — but that’s just the beginning. Houston specifically mentioned televisions, cameras and even cars as the next natural devices in which Dropbox wants to expand its reach. 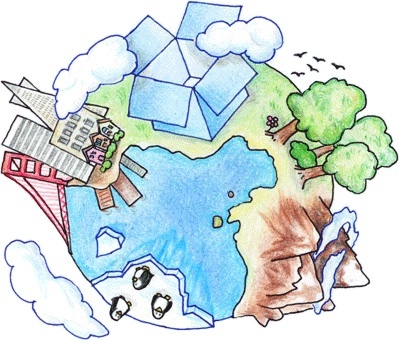 Maybe it’s via a Dropbox button on a TV remote that brings up a user’s account, or maybe it’s via automatic upload from a camera, but as long as it has an Internet connection, Houston wants Dropbox to be part of it. Ultimately, he thinks Dropbox can help deliver on the “connected anywhere” promises that have been around for years, but that he doesn’t think have truly materialized with regard to data. But once consumers experience having their “stuff” with them wherever they are, it will be “like the first day of the rest of your life,” he explained, like when we first were able to boost productivity by using e-mail and other applications on our phones. “Our job is to make sure you see little Dropbox buttons everywhere,” he added. The promise is appealing, considering that, presently, even avid cloud-storage users are pretty much limited to accessing their files only via a laptop or a mobile device. But what if you want to your listen to music on your television, or want to share photos from a recent trip but forgot your camera? Or, as Houston joked, it’s great that we can shoot HD video on our smartphones, but how many people have actually viewed one of those videos on a television? If it can deliver on this vision, Houston thinks Dropbox can be a world-changing company much like those of which its investors and board members have already been part. If you believe the rumored financials (noted in the aforementioned Forbes article, but not confirmed by Houston) — $240 million run rate, 4 percent of nearly 50 million customers paying and a $4 billion valuation — Dropbox is doing just fine but is a long way from taking over the world. Some, including Forbes contributor David Coursey (and the late Steve Jobs (s aapl)) call Dropbox merely a really good feature, but not an application or a product that can stand on its own. But with connected devices already outnumbering people by about 2 billion (roughly 9 billion to roughly 7 billion) — a gap that will only grow — there’s an opportunity to be had. If Dropbox can forge partnerships that get in front of even a fraction of the eyeballs that access Internet-connected devices, it stands to separate itself from the competition and become the de facto cloud-storage platform of the consumer world. I loved Dropbox, and miss it greatly. I felt I needed to find an alternative after reading about a bad security issue: http://zd.net/A4xvLy. I still use it for fluff (user manuals and such), but never for anything I consider personal or sensitive. see “VMWare, project octopus” I love DropBox, but the lack of LAN placement means I rely on Internet bandwidth. Vmware comes in a step ahead again. VMware also suggests a possible hybrid public and private solution. Don’t forget about customers who aren’t individuals. At my university, many professors had Dropbox accounts paid for by the school and the university was considering getting some kind of enterprise Dropbox license so that faculty and students could better collaborate. Companies/organizations certainly have a different conversion rate and price structure than individual users. And I would like to know how many of the users are active. I myself registered for 20 online storage services within the last 4 years and I am using only 2 of them. But I guess taking 250m now is a good step for growth. Think of it: Even at 4% conversion rate they got 96% free users – and they use up to 8GB of free storage. They do not buy hardware, they send a big cheque every month to Amazon for S3 storage. So these customers are really expensive – and with steady and recurring costs. Growth in freemium models can take a lot of liquidity. They should make a local storage product with their service on it. That local storage is your hard drive dummy. A service like Primadesk that gives a virtual view of all these content in one place will become an important part of solutions like the one Drew is talking about. sweet, bring it on, i need it. Dropbox is fantastic service. They’ve executed well. If they become ubiquitous then they can move from product to business. It seems like they’re well on their way. Clearly one of top 3 cloud storage players. If they have 50 million users and 4% conversion that would be 2 million paying subscribers. If they doing $240 million in revenue that’s $120 per customer which seems unrealistic. One or more of those numbers is inaccurate.